Recently I've bought so so so much drugstore makeup! 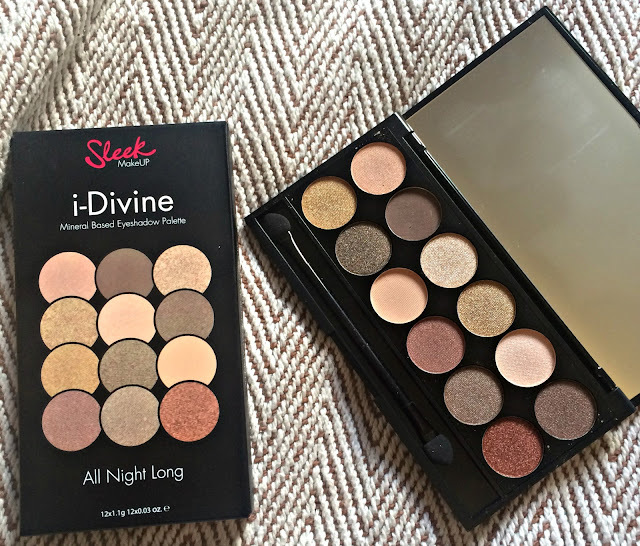 Today I wanted to write about an eyeshadow palette by Sleek called 'All Night Long'. It was £8.99 and contains 12 shadows. The packaging is the same classic Sleek packaging as the others, which isn't particularly luxury but hard wearing and does the job! I always take this one travelling with me because there is such a great range of colours. All the colours in this palette are really pigmented, however, they aren't as thick and buttery as what you get in the Sunset Palette. I do actually prefer the formula for these types of colours - they are much more velvety and soft, and with less fall-out! I really love the mix of glitter, shimmer and matte all in the same palette so you really can do so much with it! 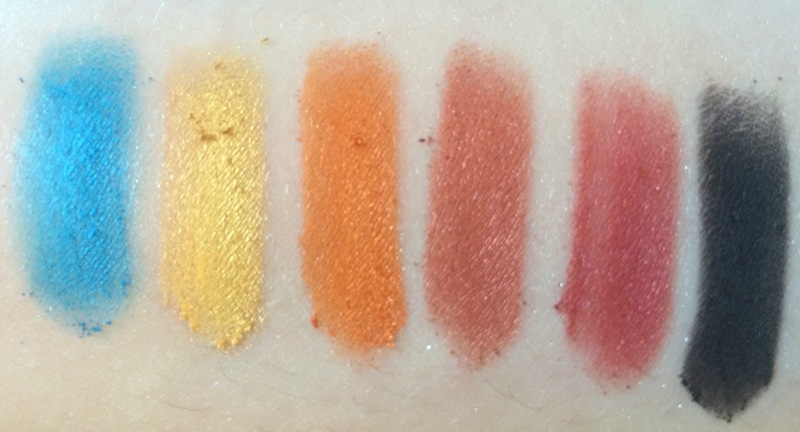 Below are the swatches for all the colours. My personal favourite is the deep gold colour which is so so opaque and eye catching - I love it! 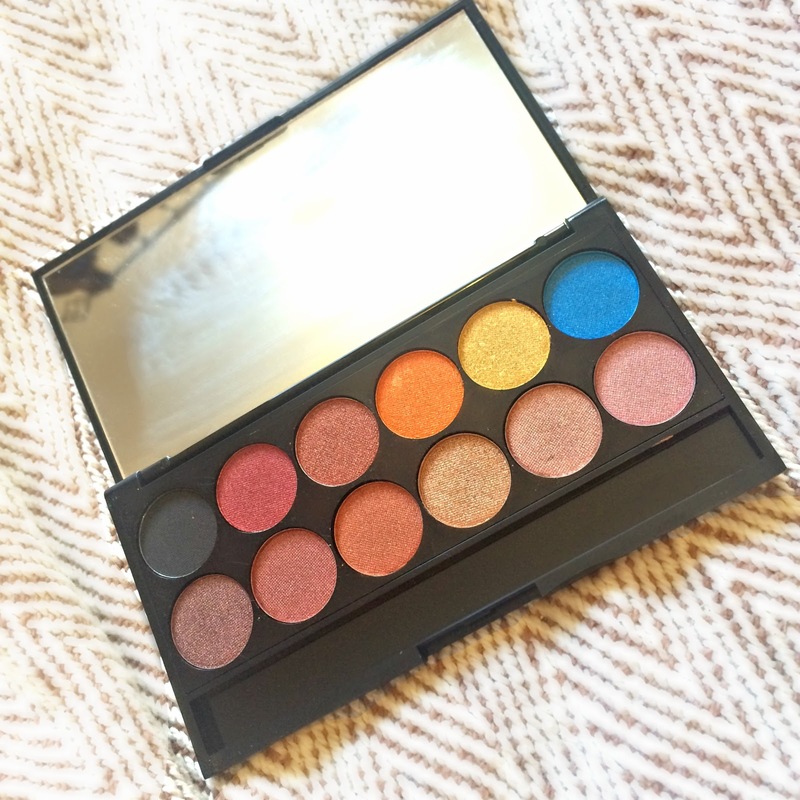 The glittery red colours the palette are also perfect for a rusty eye look. I love the matte peach colour, it's an amazing colour for a transition shade. And it's a pretty good replacement for Makeup Geek's Peach Smoothie! I think it's the perfect palette for this season, as you can create so many sparkly Christmas party looks from it! The other day I did the biggest online Sleek haul, and there is WAY too much to fit all in one post! 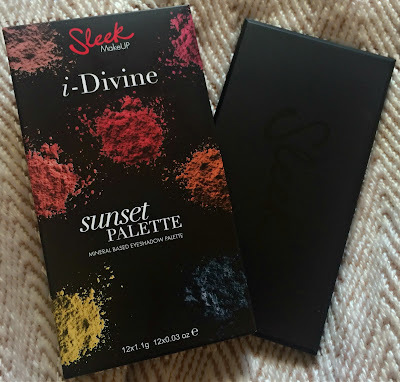 The first thing I want to mention probably the brightest palette I have ever owned - The i-Divine Eyeshadow Palette in 'Sunset'! This palette is only £8.99, and comes with 12 eyeshadows. The packaging is the black matte plastic Sleek normally does. 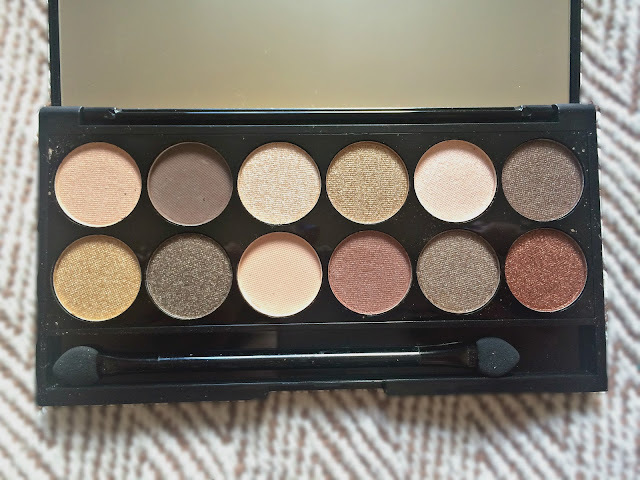 It's pretty standard but it does the job: it's really really durable and all Sleek palettes travel amazingly which is much more important to me than any packaging! These are all of the shades close up. It's annoying Sleek don't name their eyeshadows which would make them easier to talk about, but obviously, that doesn't affect the quality! I am always very sceptical when it comes to bright eyeshadows because they always look amazing in the pan, and come out much more sheer and disappointing when you actually use them.. However this is the complete opposite, I am really really impressed! 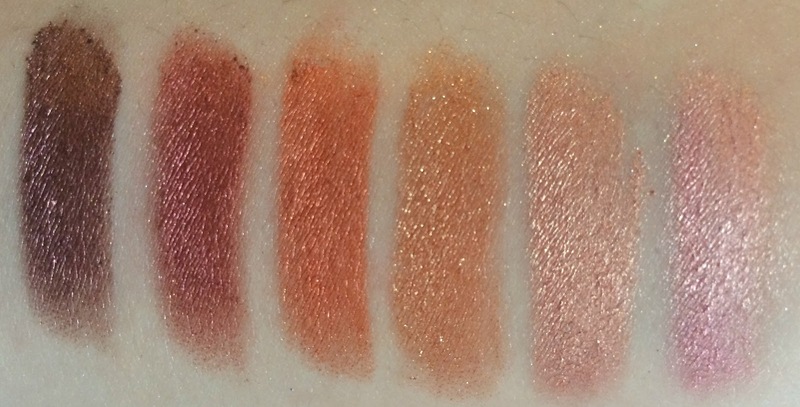 The shadows are so thick and pigmented, they are almost like buttercream. You can see from the swatches below that they are so so bright. Apart from the matte black, they are all extremely glittery. I absolutely love that in eyeshadows so it's perfect for me! The colours are also so long lasting, I can get the train at 6am and my eyeshadow is still perfect by the evening! I have honestly used this palette to death since I bought it! Admittedly, I barely (if ever) use the bright blue, yellow and orange - however, I know they will be perfect if I ever need those colours for fancy dress or a crazy look. 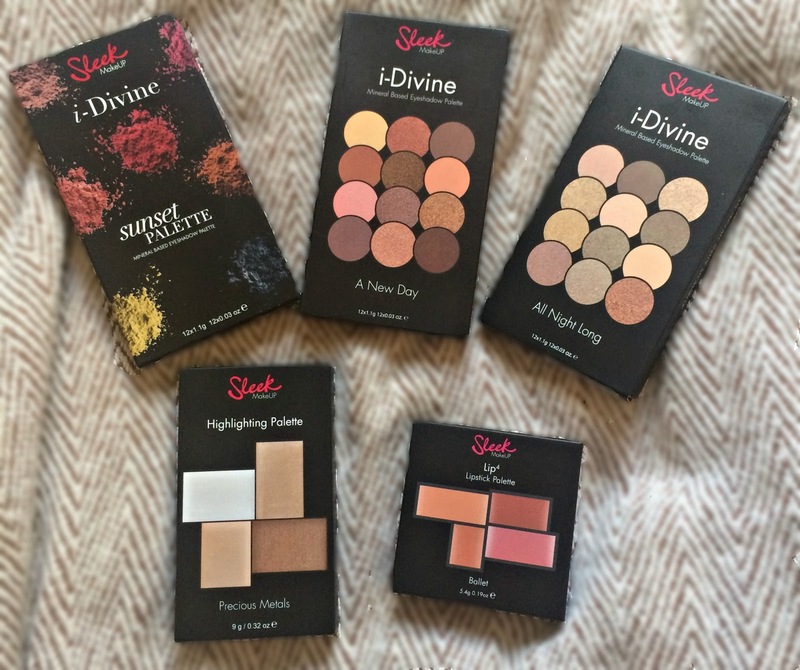 For less than £9 I don't mind not using every single colour in the palette! I have been using the dark purple/berry tones constantly - especially now it's autumn. My go-to look these days is a dark plum eye with the darkest purple colour in the palette all over the lid, and Mac's Heritage Rouge pigment through the crease. Have you ever tried Sleek's eyeshadows? What do you think? It’s suddenly November, wow! Summer is officially over and Christmas is approaching! Some people have their lights up or their presents bought and wrapped... If that’s all a bit too much for you, then maybe take the first baby step and check out these advent calendars. Chocolate is so 2015, it’s all about beauty calendars now. So many amazing brands and stores make these now, and I’ve been pining over them all for way too long! So I felt its only right to list my top calendars of 2016! A lot of the huge huge ones have already sold out (Kiehls, Diptyque,) so I've tried to include ones that you can still get your hands on - be quick! I’ve split them into 3 price ranges, from budget-buys to utterly eye-watering (but totally worth it)! These calendars don’t completely drain your purse for the Christmas season, but they are a great price for all the lovely gifts inside. One for the bargain hunters! I actually adore Makeup Revolution! For such a low price point their quality is incredible, and they are super on trend with everything they release. 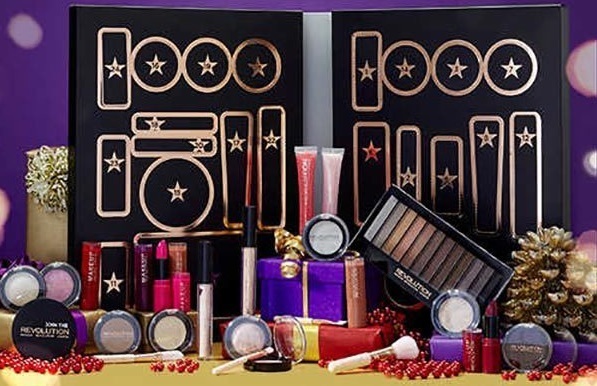 This advent calendar comes with the full 25 pieces of makeup in really sleek black and gold packaging. It could be a bit more luxury and christmassy in my opinion - but hey! Can you really complain at £25? The calendar includes 6 lipsticks, 2 glosses, 1 eye primer, 1 liquid highlighter, 3 eyeshadows, 1 blusher, 1 highlighter, 1 anti-shine balm, 1 bronzer, 1 strobe cream (my fave! ), 1 face brush, 1 foundation brush, 1 angled brush, 1 eyeshadow brush, 1 mirror and an eyeshadow palette! WOW! One for the friend with perfect nails! I'm obsessed with the packaging on this Ciate advent calendar! It is such a cute mix of purples, pinks and rose gold. The calendar comes with 1 full sized glitter nail polish (in gorgeous rose gold packaging) and 22 minis. There's also a rose gold glitter nail file which is honestly too pretty to ever use! There's a really great variation of colours in the set too not just Christmas shades - which doesn't often happen in Christmas sets. Obviously there's your berries and dark forest greens for the festive season, but there's also loads of nudes and pastels for all year round. One for the beauty explorer! I was so so excited to see ASOS were releasing their own advent calendar - and it doesn't disappoint! The packaging is almost Anti-Christmas (!?!? ), but it's a sleek white marble with a reversed black marble interior. I think I would actually keep the box if someone gifted me this, it's so gorgeous! Worth £175, I've dubbed this calendar for explorers because it's packed full of lesser known beauty brands as well as house-hold names. There are 24 products, all ranging from haircare, makeup and skincare - which is amazing! As I said, there's well-loved brands such as Batiste and Burt's Bees as well as some bits that you may not have tried yet. If your looking for something a little more special but don't want to spend hundreds, these are for you. A perfect balance between great value and treat yo' self. One for the lipstick lovers! I wont lie, I really don't like / really don't get this packaging. Don't get me wrong, it's really cute - but not Christmassy at all! However, the contents completely destroys any reservations I may have! 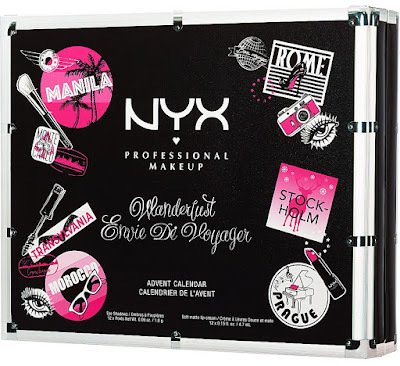 It contains 12 of NYX's amazing lip creams (a cult classic) and 12 mini eyeshadow. 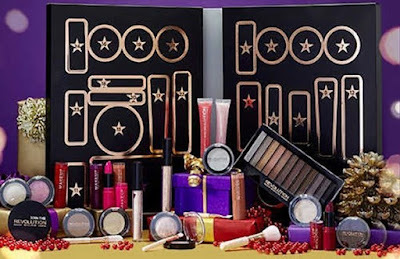 Any makeup addict would LOVE this! One for the man in your life! This pleasantly festive (but masculine) packaging comes with all the essentials any man would need. I know a lot of men aren't really in to that kind of stuff, but if they don't have a sweet-tooth then this is a really nice gift. It doesn't contain a lot of crap that a man wouldn't really use, it has 12 essential skincare items - so it really would be worth it. 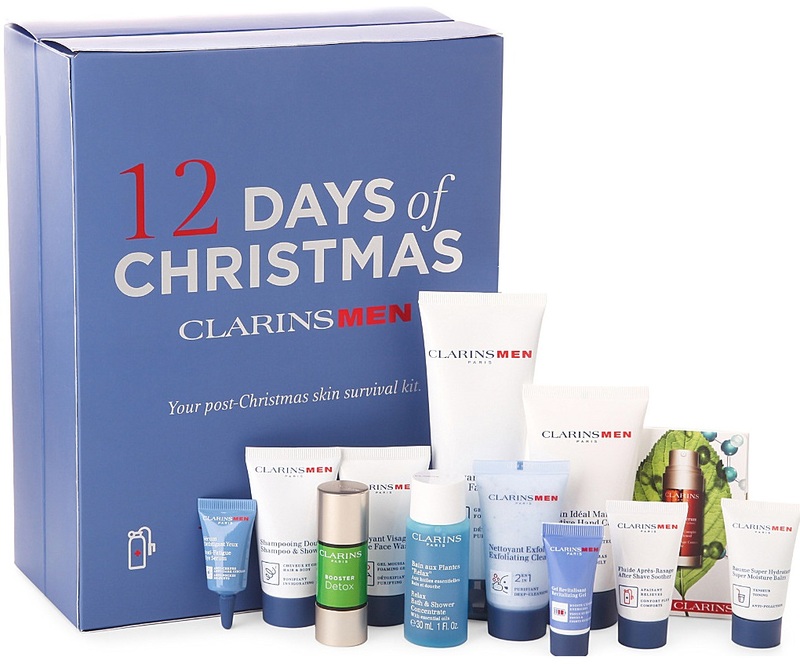 It's filled with skincare, haircare, shower bits and shaving essentials. One for the friend who loves designer beauty! 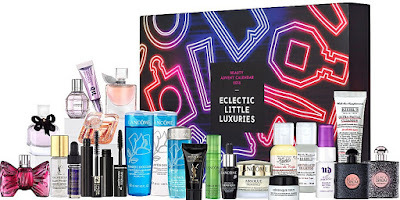 This bright beautiful box is stuffed to the brim with all the best products from Lancome, YSL, Viktor & Rolf, Kiehls, and Urban Decay. It's got a few products in there from each brand, and it's a huge range: from skincare and makeup, to perfume and haircare" I think it's fab if you personally want a bit of an intro into those brands, or if your worried about buying someone 25 days of a brand they hate! If your paying over £100 you expect an epic calendar, and there's a lot of expensive calendars out there that are just full of products that didn't sell well throughout the year! 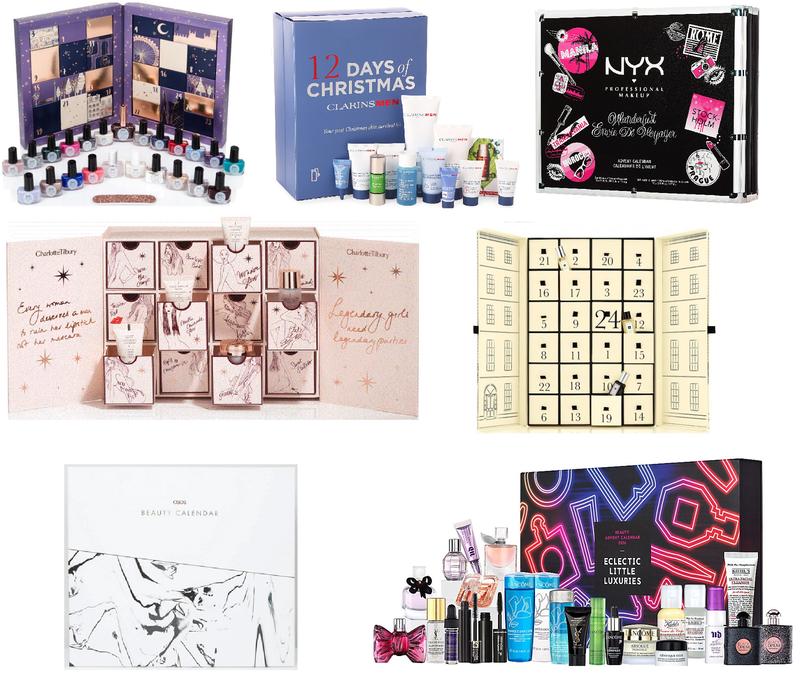 These, however, are the daddies when it comes to beauty advent calendars - they come at a luxury price but certainly fit the luxury bill. One for the CT junkie! This is my absolute favourite calendar of them all. Charlotte Tilbury absolutely kills everything she releases, especially her limited edition Christmas products. This advent calendar is a beautiful pink and rose gold box with 12 sliding draws filled with make up and skincare. There's a lot of full sized products in this calendar so it truly is worth the money in my opinion. This box is basically a full skincare routine and full face of makeup, so it really is an amazing gift! One for the fragrance queens! If you love Jo Malone, you know that it's one of those brands that is expensive but totally worth it. This calendar is a true homage to London and all things British, designed as a beautiful Georgian town house. The calendar contains 24 products that are a mix of colognes and cremes, as this years calendar is all about layering and creating your own unique scent. The specifics of what's included is actually a secret - so you'll have to buy it to find out! What are your favourite calendars of 2016? Or do you prefer chocolate! ?